IGN - When dreams turn to nightmares. No offence to Coby Bell, but he was kind of asked to perform here at a level that's WAY over his head in the acting skills department. I thought he did a pretty good job breaking down at the end. This show is levels above most x-men media in terms of writing and characterization. You actually care about each of them and their context for their actions. I thought this was a stronger episode than the past several. It's a shame the writers don't have enough faith in the format, or the future of the show, to allow a bit more time to develop things like trust (pretty ham-fisted family life-saving effort resulting in feels from the nervous mutants considering that the main leaders already trust the fam enough to allow them a major role in the rescue efforts and the hospital run). I did enjoy the kidnapping scene. Polaris getting some revenge on agent jace was satisfying and a good excuse to show some mutant power moves. Dreamer's powers are definitely problematic. I hope the show is afforded the chance to explore some of the ethical dilemmas she will face, beyond simply a hand-wavy "there was no other choice!". I was actually surprised that she expressed some misgivings about leaving Jace in whatever limbo she was forced to leave him in, especially since she wasn't contrite about messing with Blink until confronted. The Reed Strucker rescue then immediately put yourself back into danger was also pretty lame, but pretty typical for this type of show. I wonder how far into the realm of Antifa they will push the mutant underground considering our current political climate? My wife and I had been lukewarm on this show. We thought we were caught up when we started playing this ep but the 'previously on' quickly told us we'd missed one. We looked at each other, shrugged, and just let it keep playing. We ended up quitting partway through this episode. It's clear the show spent the bulk of its effects budget in the first few episodes - everyone running to the next room where Blink's portal was hidden off-screen was ridiculous, as was the 'shoot a drone via car mirror but we don't even have $$ for the explosion'. In terms of writing, the "oh god this man is suddenly dying so I have to ... pull the bullet out? That'll fix it!" emergency surgery storyline was intolerable. Worst was the secret loud whispers in front of Sentinal Agent Man wherein they inadvertently told him everything he would need to know about what they wanted to get from him. I can't believe the writers haven't even seen an episode of, say, The Americans to know how to effectively write a scene like that. 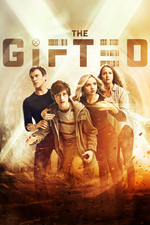 Don't think I'm down on the show because of the genre - I'm typically a fan of all the X-stuff, but this show has proven it isn't worthy of my time. I like the ethical stuff that's come up with Dreamer's powers. I wasn't feeling much, if any sympathy for Jace but that ending was definetly a kick in the head. Talk about trauma. None of the episodes are particularly selling me but each of them have a moment or an event that draws me in and keeps me watching for now.